Once a month the Chamber’s committee meets to discuss issues affecting members, agree events, funding for projects and much else with the ultimate aim of promoting the interests of members. Below is a round up of the meeting on the 6th February. It was agreed that committee members will be contacting those who have not yet paid. The Chamber wants to know the views of members on the current and future state of retail in the town. Opinions are needed by this Friday (15th) as Craig will be interviewed on the subject by the Haslemere Society magazine. If you have any thoughts please email Craig at president@haslemerechamber.co.uk. The Chamber AGM will be held on Wednesday 3rd April at 6.30pm, venue and details to be confirmed. This is when new committee members are decided, so if you want to join the committee, come along! Plans are afoot to encourage retailers across the town to make disability friendly chairs available to help out those who have mobility issues and make Haslemere more disability friendly. We will publish the ideal specifications of these chairs in due course, but essentially chairs with arms is the main requirement. Funding is being explored. The Chamber has been actively promoting member businesses on the Chamber website over the last four months. In the lead up to Christmas our focus was on our retail members. New pages and copy were created to form more interesting landing pages that you can see here. Over this period we increased the number of visitors to the website by 65% to 1,585 with each user spending an average of 3 minutes per visit. The intention was to promote our hospitality sector in the first quarter this year. But although the pages have been created (click here to view), we have decided to review our promotion options to see if this is the best use of member subscriptions. The Chamber will explore alternative ways of promoting the membership online, including via the Chamber Twitter account. @HaslemereChmbr has more than 1,000 followers, and regularly has a reach of more than 3,000 impressions. 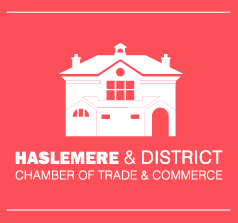 Please continue to use #Haslemere in your tweets and Instagram posts. What would you like the Chamber to be doing? Should we continue with the breakfast club and in what format and topics? Should we run evening events – about what? Is our “Keeping Haslemere High Streets Alive” a worth while campaign? What about a Business Improvement District? Cooperation with the other Waverley Chambers and the Council? Our intention is that results will be available for discussion at the AGM. Creating a subcommittee to look at increasing awareness of off-High-Street businesses. Highlighting the member online directory through the newsletter. How the Chamber could become involved with the Haslemere Hounds project. Craig to discuss with Martin James an idea about a murder mystery event event called Death on the High Street. Craig has approached Waitrose about installing an ATM at the store, which the store manager has put forward to Waitrose headquarters. Paying towards the cost of this year’s Christmas lights, the contract for which is up for negotiation. The presidents of the four Waverley Chambers of Commerce meet regularly to discuss ideas on how we could cooperate and build on the success of last year’s Big Awards. At the last meeting Rosemary French, President of the Cranleigh Chamber, suggested a “Question Time” type event. The idea was to hold the event at somewhere like Charter House, be hosted by a local celebrity and have a panel of politicians and business people. Our Chamber committee agreed to support in principle but need to know more about what is involved before committing resources. The committee wishes to thank Caroline Warrington for all the hard work she has done for the Chamber as Treasurer and sorting out the Chamber’s bank accounts. Narn of #Tweetingbyhand is also thanked for all her efforts promoting the Chamber through its Twitter account. Finally, the committee thanks Jo Culley for stepping in to take the minutes for the latest meeting.